Nov 20th, 2016: Power and capacity improvements to VPH16-900 16 volt drag racing battery. It can now start just about any engine, and will last longer between charges too. Resistant to tire shake and can be used to bump engine. Feb 8th, 2012: New lightweight M6 female to SAE top post terminal adapters/converters. Only 16 grams per set! Nov 23rd, 2011: We are looking for some testers to provide feedback on a new series of batteries. We will provide the batteries to you. We are looking for cars like the following: a Ferrari (modern), a BMW (E90/92/93), a Porsche, a Lotus, a GT-R, along with a Porsche GT2 or GT3. Other cars may be ok. If you have one of these or another suitable car, more than a basic knowledge of cars, and currently have a battery heavier than 15 pounds or so, contact us for more details! Dec 4th, 2009: Voltphreaks is supporting NASA at the 25 hours of Thunderhill race with a contingency program. Display a Voltphreaks decal on your car and you can win a free $2000 VPR-P6 battery! UPDATE: Team Nitto/Bullet 1 (Ralph Warren) has won the contingency and will be receiving a free VPR-P6 battery! March 22nd, 2009: The #62 Risi Competizione Ferrari of Pierre Kaffer, Jaime Melo and Mika Salo won the GT2 class of the 100th American Le Mans Series race in a dominant fashion today – leading the 2009 season-opening Twelve Hours of Sebring from the second hour until the finish. Two significanly heavier lead-acid batteries were replaced by a single, lightweight and more electrically efficient, Voltphreaks battery that easily powered the car through the entire race! 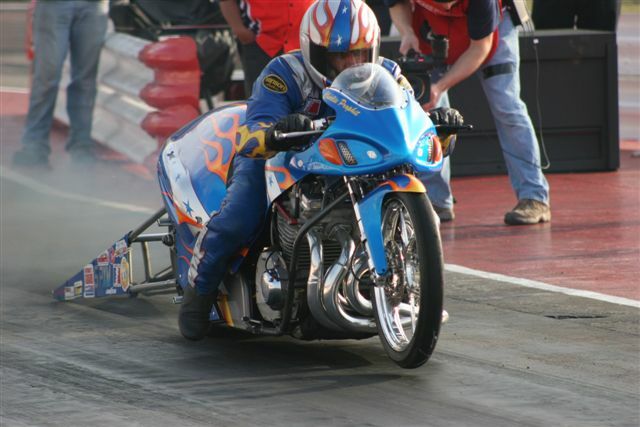 March 22nd, 2009: World Record Holder in PXM ADRL running Voltphreaks battery. Charlie Prophit #5 4.237 ET in the 1/8 mile! March 5th, 2009: Website revised, new website design uploaded. We are pleased to be working with J.R. Motorsports. They are using our first 16V drag motorcycle battery, with excellet results so far! Jan 21, 2009: Stock turbo Evolution world record run using 3lb Voltphreaks racing battery. Sept. 17, 2008: Second generation of lithium iron phosphate racing batteries released. Voltphreaks releases the next generation of their lightweight lithium batteries for racing applications. Designed to replace standard 12V lead-acid starter batteries, the Voltphreaks batteries weigh up to 80% less while providing the more cranking power.